the right to vote, serve on juries and hold public office. voter in the state of Missouri. Aware of the emerging feminist ideas of the time, the Fair's officials established a Board of Lady Managers. Composed of 23 women that represented every geographic of the country, the women helped set guidelines and decency codes (especially for the racy Pike attractions), at the 1904 Exposition. Mrs. James L. Blair was the first President of the Board, which was situated in the Physics Building at Washington University. The organizers also decided to not include a women's building at the Fair, as it would suggest an apartness rather than an integration of equality. There were many women exhibits at the State buildings and palaces, including prominent displays at the Palaces of Manufactures and Varied Industries. Mrs. Daniel Manning, who was once married to the US Secretary of the Treasury, used her influence and contacts to gain 4.5 million dollars for the Louisiana Purchase Exposition Company. Yet, with this modern handle of the importance of women's rights and their achievements, a female doctor from New York was denied entrance when she entered a ladies’ lounge in a “pant suit.” Though she was eventually admitted, the matter was exacerbated in the local newspapers. Sarah was an author of who also wrote a cookbook entitled “The World’s Fair Cookbook.” Rorer, the author of 75 cook books and pamphlets, edited her own magazine Table Talk, and the short-lived Household News and was domestic editor of the Ladies Home Journal for 14 years. She headed the Philadelphia School of Cooking from 1883 to 1903. She also operated- The Model Restaurant (East Pavillion Cafe), which could seat 1200 people on the fairgrounds. She rented the East Pavillion Cafe for 7,500 dollars. Rorer was the guest of honor on `Cooks Day,' at Chicago's Women's World's Fair in 1925. Among her other major books were Mrs. Rorer's Vegetable Cookery and Meat Substitutes, one of the most detailed and savory of vegetarian cookbooks- Mrs. Rorer's Every Day Menu Book. This book offered a complete suggested menu for each of the 365 days of the year, 3 meals a day: breakfast, lunch and dinner. Her World's fair Cook Book, sold for 50 cents. She also had the reputation of being a master coffee brewer, as she sold cups for 15 cents and tins of coffee too. Click on link to see the entire World's Fair Cookbook written by Mrs. Rorer. commissions and won major competitions. for the 1893 World's Exposition. Longman’s statue was noteworthy because it depicted “Victory” as a man, not as a traditional woman. Later in New York, she worked closely with the famous sculptor Daniel Chester French on many projects, including the Lincoln Memorial. Ms. Keller visited the Fair; a “Helen Keller Day” was held to promote education of the deaf. She was born in Tuscumbia, Alabama, on June 27, 1880, nineteen months after her birth, Helen was afflicted with either scarlet fever or meningitis. The illness left her deaf and blind. Keller attended the Royal Institute For the Blind in 1888. After attending the Wright-Humason School for the Deaf and Horace Mann School for the Deaf, Helen entered Radcliffe College in 1900. Standard Oil magnate Henry Huttleton Rogers paid for her education. At the age of 24, in 1904, Keller graduated from Radcliffe, becoming the first deaf/blind person to earn a Bachelor of Arts degree. Keller went on to become a world-famous speaker and author. She is remembered as an advocate for people with disabilities amid numerous other causes. She was a suffragist, a pacifist, a radical socialist, and a birth control supporter. Keller suffered a series of strokes in 1961 and died in her sleep on June 1, 1968 at the age of 88. German-born Elizabeth Servaty, later known as Plinky Topperwein was the best lady shooter in America. Adolph `Ad' Topperwein married Elizabeth on Jan. 11 1903. Ad began teaching Elizabeth the finer points of the .22 and was amazed at how quickly she mastered things. `Plinky,' as she was named (because of the sounds of the tin cans that she shot), started her shotgun shooting with a little 20-gauge gun at the 1904 St. Louis World's Fair. With a Winchester Model 03 .22-caliber autoloading rifle, she broke 967 of 1,000 clay disks thrown into the air from 25 feet in 90 minutes. In 1904 she became the first woman to break 100 straight at trap, a feat that she had done 200 times during her career. She also broke 200 straight 14 times before the days of registered shooting. For 42 years, Plincky and Adolph traveled the entire United States, Canada, and Mexico, giving exhibitions of aerial rifle shooting and trapshooting. Plinky's one and only meeting with the popular Annie Oakley was in front of President Calvin Coolidge and his First Lady. She died in San Antonio, Texas, in January of 1945. Jessie was on Dec. 23, 1870, in Hamilton, Ontario, Canada. She moved to to Williamsburg, Massachusetts in 1887 to teach school and the following year, she won a camera in a magazine contest (2.5 x 4 inch plate camera without a manual focus), she began taking photographs. Moving to St. Louis, Beals hoped to win a job at one of the local newspapers as a staff photographer. No one hired her. Beals talked the officials into issuing her a pre-event pass to take photos before the Fair opened. The photos that Beals took so impressed fair officials, that a local press bureau hired her and issued her a permit to photograph the Fair. Jessie's photographs were critically acclaimed, especially here pictorials on the Philippine exhibit, exhibition buildings, military parades, various dignitaries, and the Fair's international airshow. She shot from 20-foot ladders and in hot-air balloons, in order to achieve an different perspective. Beals was awarded a gold medal by the Exposition for her aerial photography. Keep in mind that Jessie did all this with over 50 pounds of camera equipment as well as wearing a corseted dress and fashionable hat. Beals stayed in St. Louis for a while after the Fair, selling her photos of the Fair out of a Morgan Street store that she and her husband owned. Later, they moved to New York City to open up a photography studio. In 1928, she moved to California and switched from glass to film. Despite the old age and several serious illnesses, Beals continued to photograph. Financial strapped because of the hospital costs, she died on May 30, 1942, in a charity ward at Bellevue Hospital in New York City. Kate Chopin: Kate Chopin was born Kate O'Flaherty in St. Louis, Missouri in 1850. The third of five children, she was the only sibling to live past the age of twenty-five. Kate was an American author of short stories and novels, mostly of a Louisiana Creole background. She is now considered to have been a forerunner of feminist authors of the 19th century. Kate Chopin wrote very rapidly and without much revision. 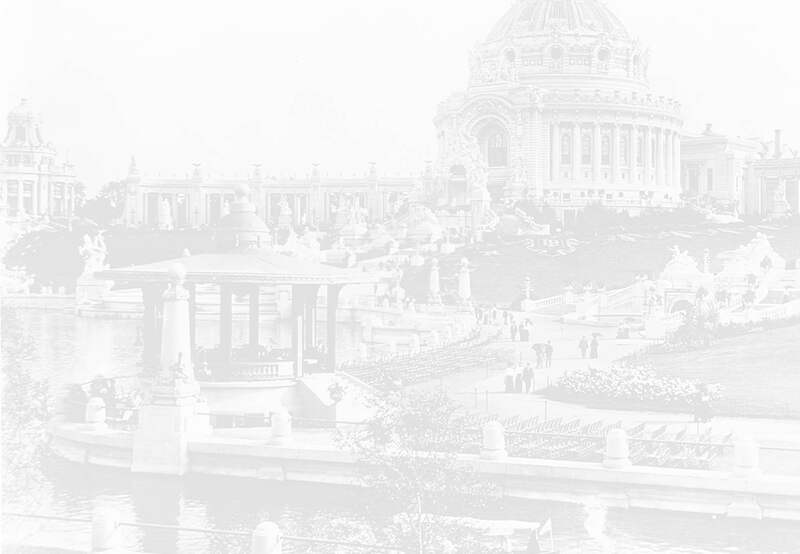 On a hot August 20th day, Kate visited the 1904 Exposition; she collapsed at the Fair. Two days later, she died in her home of a cerebral hemorrhage. Lucille Mulhall: Born on October 21, 1885, Lucille was the daughter of Colonel Zach Mulhall, an Oklahoma ranch owner. Unlike her sisters, she wasn't interested in dolls and sewing or piano lessons but preferred branding yearlings, roping a variety of animal, training her small, sure-footed ponies, and practicing the trick riding that was to make her famous all over the country. Though she loved the dangerous life of cowboying, she could also become the society belle. Mulhall Ranch on December 21, 1940. Note- Rambling through research six months ago, I saw something that suggested the famous shooter Annie Oakley worked the 1904 World's Fair, possibly as an independent short-time or one-time guest star. Presently, I can't re-discover the info. to support this; so now, it should be considered a `light' rumor. I will continue to look up this matter and hopefully (LOL), confirm or deny it. There were many paintings displayed by women in the Art Palace, and several female organists gave concerts in the Festival Hall. Rebecca Ann Felton: was an American political activist, writer, and lecturer, as well as the first woman seated in the U.S. Senate. In 1852, Rebecca Ann Latimer graduated first in her class from the Madison Female College, Madison, Georgia, was married to William H. Felton, a local physician active in liberal Democratic politics a year later. She assisted her husband in his political career (as a U.S. congressman and later in the state legislature), writing speeches, planning campaign strategy, and later helping to draft legislation. Together the Feltons promoted penal reform, temperance, and women’s rights. Rebecca Felton was equally outspoken in her prejudice against African Americans and Jews and her advocacy of child labour and lynching. She served on the board of lady managers at the 1893 Chicago Exposition and was on the agricultural board during the 1904 St. Louis Louisiana Purchase Exposition. Senator Thomas E. Watson. She served only two days, (November 21–22, 1922), before being succeeded by Walter F. George, the duly elected senator. She wrote several books, mainly base upon Georian women and life.